Backup data and transfer all of your files quickly and easily with this New Plug & Play USB External Portable 2.5 inch hard drive! 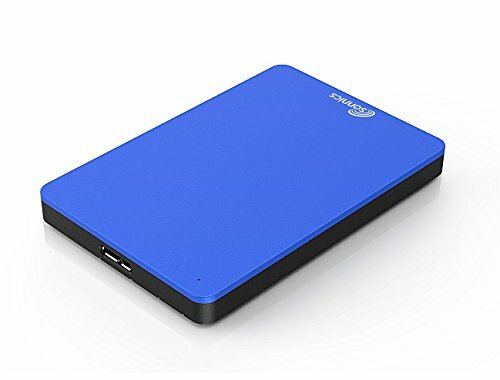 From SONNICS, with a slim design and a super speed USB 3.0 interface, this Hard Drive offers both style and speed with data transfer rates of up to 5Gbps, USB 3.0 (also known as SuperSpeed USB) has a maximum bandwidth rate of 5 gbps (gigabits per second) That translates to 640 MBps (megabytes per second) ten times faster than USB 2.0 (aka Hi-Speed USB). in one compact package. Its portable design makes it ideal for carrying around with you, and all it takes to connect is a USB cable. The aluminum case provides excellent heat dissipation and helps keep your drive keep cool! Whether you’re using a PC or a MAC (desktop/laptop), most smart TV’s check your tv manual to make sure its compatible, PS4 and Xbox one, simply connect this external storage device and transfer your digital files in a breeze. You can use this drive on a PS4 and XBOX ONE to install and runs games from you will need to format it on your Console before use which takes a few minutes then you are good to go.